Five pre-programmed temperature buttons tell you which temperature tofor which type of tea. It heats to the selected temperature, turns itself off, and if selected, will even keep warm for 20 minutes after heating. It features a push button, soft opening lid to prevent hot water splatter, quiet boil element, 1.7L cordfree jug, easy to read BPA free water windows, concealed element, and a scale filter. 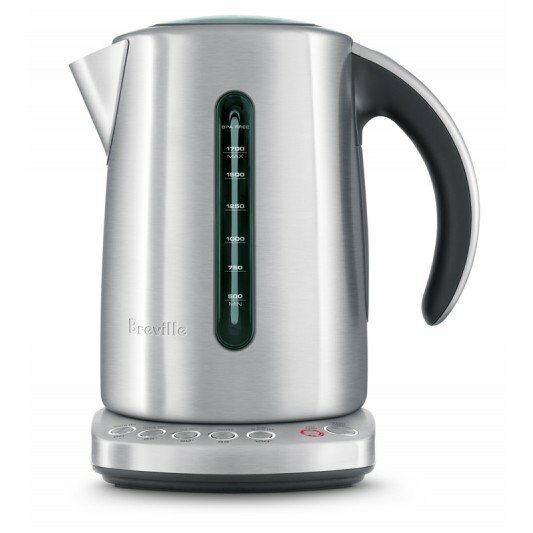 The Breville BKE825 Kettles was added to the Kettles category in June 2016. The lowest price GetPrice has found for the Breville BKE825 Kettles in Australia is $129.00 from Billy Guyatts. Other merchants who stock it are Billy Guyatts, Bing Lee, House, Appliances Online.